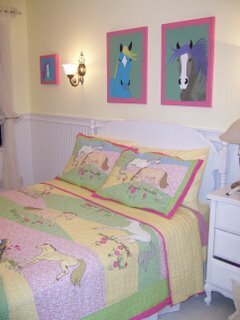 Believe it or not, I painted the horse pictures. I'm a little disappointed that the colors I chose for the horses don't really go with the bedding, but they look pretty good none-the-less. Thank goodness I insisted on trying so many different yellows because I love the one we finally used. What do you think? Wow - it looks fab!! and I love the horse pictures. Kathy it looks fantastic! I can't believe you painted the horses...well done!